Performs very well in malware detection and blocking. 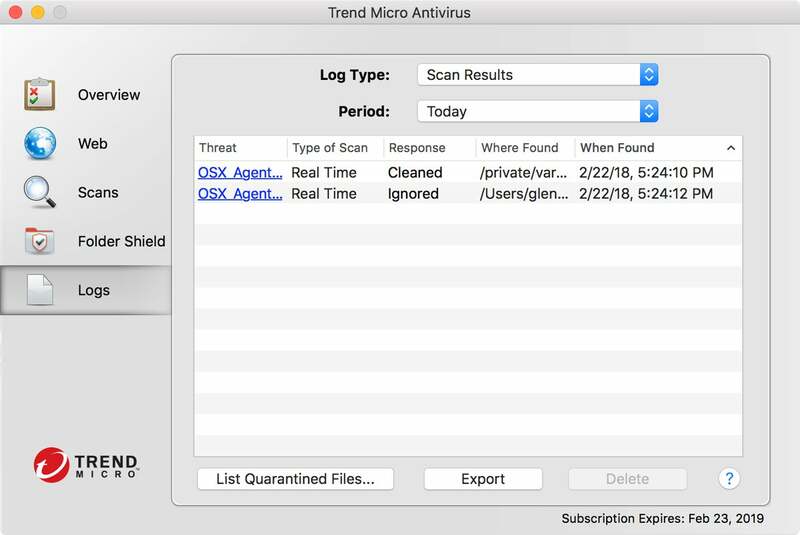 Trend Micro’s Antivirus for Mac offers solid malware detection and deterrence in a simple package with a straightforward interface. AV-Test found in its testing that it detected 99.5 percent of macOS malware, over 95 percent of macOS potentially unwanted applications (PUA), and over 99 percent of Windows malware. Trend Micro blocks a malicious web page. In our spot testing, Trend Micro’s real-time scanning identified macOS malware as soon as it was unzipped from an encrypted archive, and block malicious Windows malware in the browser. While Trend Micro doesn’t have active monitoring of ransomware file encryption and deletion, it does at least offer a kind of lockbox: you can use Folder Shield to mark document locations, and it comes with a few folders tagged, such as Desktop and Documents. We had trouble initially triggering the feature in testing after reading the program’s help instructions. In our testing, the ransomware shield didn’t provide promised blocking. Turns out—after consulting with the company and testing a simple Terminal script—the documentation isn’t right, but the program does protect against attacks. The help files say that any attempt to write will provoke a warning to add an app to a Trusted Program List. In practice, the software relies on various signals, and only triggers Folder Shield in more specific circumstances. Since we were able to see files blocked, we know the feature works in practice, but we don’t know all the parameters. 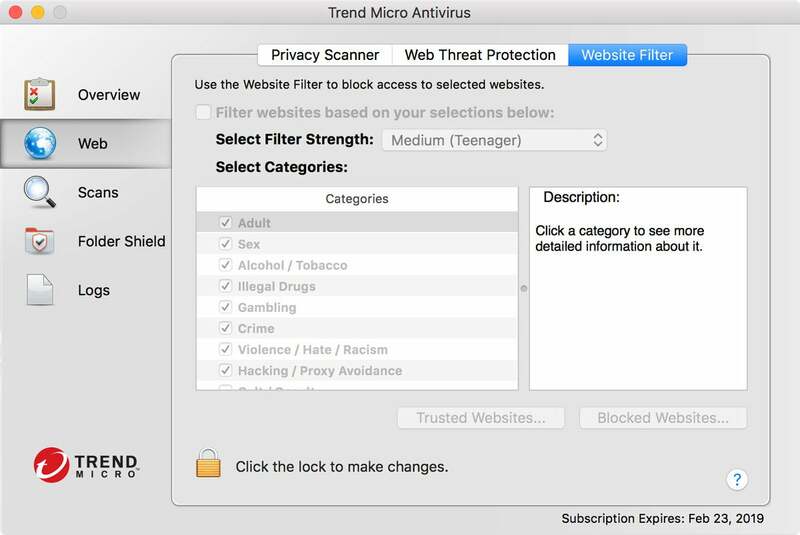 Trend Micro offers website filtering as an option. The Safari extension would not install, even though it all seemed to be configured correctly. Safari prompted me with a dialog in which I clicked Trust, but the extension never installed. However, blocking of malicious files still worked even though the extension didn’t appear in the list. Chrome was more successful: the extension installed but had to be manually activated. Trend Micro lets you enable a mouse-over feature in browsers that checks links as you hover, marking them with a green checkmark, red x, or other icons. The Antivirus software also includes a basic Web filter for parental control. The log of events is compact and not easy to read. Trend Micro is a no-frills, solid performer in detecting and blocking malware, especially in real time. However, if you need additional features, such as network monitoring, remote-device management, firewall control, or others, Trend Micro is too expensive relative to higher-ranked competitors.